Your holiday guests are arriving in 15 minutes and your house is not exactly the epitome of cleanliness. Don’t panic! Here are a few tips and strategies for cleaning your house in 15 minutes—or at least giving the appearance of having a spotless domicile. 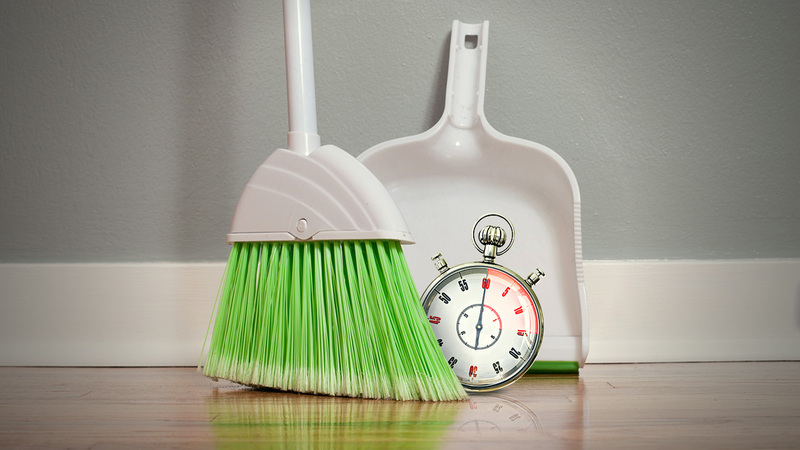 A lot can get done in a few short minutes if you’re smart with your time and strategic with your cleaning choices. You don’t have time to engage in serious cleaning with your full collection of cleaning equipment and products. This is not necessarily the time to thoroughly clean the microwave or the dishwasher, even though those tasks need to get done at some point. Spend 30 seconds thinking about your strategy: You might even grab a notepad and jot down a brief housecleaning checklist. The key is to keep moving so that you do not get bogged down with one particular task. It is better to hit several areas for a brief time than to spend all 15 minutes on one job. Think big picture and cover all the areas that are important. When people come over, your time together may be limited to particular spaces. This typically includes the kitchen, 1 bathroom, and a gathering space, such as a den or dining room. Concentrate on these spaces as most guests don’t wander to other rooms or open closets. If you want to prioritize, spend an extra minute or 2 in the bathroom, as a dirty bathroom can be especially obvious to a guest. If you are going to clean anything, you may want to clean the floors in common spaces. Sweeping up the kitchen and vacuuming the den may only take a couple of minutes, and it can make a big difference in terms of perception and overall appearance. If anything, the tracks left on a freshly vacuumed carpet may give guests the general appearance of more concentrated cleaning. In the event that you do not have time to get out this type of equipment, at least spend a minute looking around common areas and picking up noticeable pieces of trash and junk. Grab a laundry basket and/or unused tote bags and go through the house and collect everything that is not intended for that space. Stash the laundry basket and bags in a room that will not be used. Stuffing items in a closet or under the bed may also be a possibility, but if your house is already cluttered, chances are, those spaces are already occupied by previous de-cluttering sessions. Note: Consider grouping all your mail and paper clutter together so that you don’t lose important documents or bills and can sort through them after your guests leave. Enlist help: When it comes to quickly cleaning the house, it is all hands on deck. Grab the kids and the significant other and put them to work. Younger kids may not know how to clean a house effectively, but they may be able to handle the gathering of clutter. Employ distractions: It isn’t as if you want to deceive your guests, but there is nothing wrong with creating a little bit of atmosphere. Therefore, lighting a couple of candles may contribute to a cozy atmosphere that takes attention away from the fact that you weren’t able to deep clean the house. If the candles are scented, this may also provide a pleasant smell that hides other odors. Leave time to get yourself ready: You do only have 15 minutes, but at some point you have to call it good and stop the cleaning process. Leave a couple of minutes to get ready so that you don’t feel rushed. You don’t want to be on your hands and knees, scrubbing the floor when your guests arrive. Do your best, but make sure you enjoy the reason for cleaning the house in the first place. You can do a lot in 15 minutes, but if it isn’t perfect, life will go on. Vacuum cleaner. A vacuum cleaner may make a large difference when it comes to the overall appearance. You obviously have limited time, but if you are going to drag out a piece of cleaning equipment, go for the vacuum cleaner. Disposable floor mop and dusting pads. In terms of hard surfaces, it may not be feasible to get out a bucket and mop. The nice thing is that today there are various floor cleaners that are designed for fast cleaning. Dry dust cloths can be used to dust obvious surfaces. These clothes are designed to pick up more dust than the average rag. Again, watch your time and only dust those areas that may be obvious to anyone in the room. Disinfectant wipes are intended for multiple surfaces. Grab a couple of these and wipe down the kitchen counter and various bathroom surfaces. Paper towels will help you to quickly dry wet surfaces and buff surfaces to an impressive shine. A shiny surface in common areas will go a long way to establishing appearances. Toilet scrubbers with disposable cleaning heads allow you to clean the bowl and toss the scrubbing head without using additional supplies or requiring extra cleanup. Air freshener can help to quickly brighten up the air in your home. Tip: Use baby wipes to freshen surfaces and add shine if you’re in a pinch. Before you start, list your priority rooms: Quickly jot down the rooms that will be used and focus your efforts there (usually the kitchen, a bathroom, the dining room, and sitting room). Stick the list and a pen in your pocket and cross them off as you go. Below is a basic checklist to help you get started. Note: Remember, there is no time for deep cleaning, and you still need to leave yourself some time to get ready. Use your best judgment to sacrifice cleaning where you can. Toss a lemon peel into the garbage disposal and run it. Clear clutter off the kitchen table and counter tops-put papers into bags, items into cupboards. Wipe down counters and the table with disinfectant wipes. Use a toilet scrubber or wand with a disposable cleaning head to scrub the bowl clean of stains and smells. Clean the toilet seat (surface and underside) with a disinfectant wipe and quickly towel it dry. Wipe the mirror clean using a lint-free cloth (or newspaper) and glass cleaner. Wipe down the sink, the sink basin and faucet with disinfectant wipes and paper towels. Tip: If you have extra time, mop or dust the floor to clear it of hair and other debris. Otherwise, throw down a fresh bathroom mat to cover up what you missed. Clear accumulated papers and books and junk off of the dining room table. Dust the dining table surface with dust cloths or lay a tablecloth over it. Run a floor duster/mop (with disposable pads) quickly across the floor. Clear clutter into bins or bags and hide out of sight (closets or a closed off room). Vacuum the carpet or dust/mop the floor with a disposable cloth system. Walk through your home spraying air freshener in each of the areas where your guests will spend time. Light a scented candle in the foyer or sitting room.